Call to order, or stop in so we can help you customize your order! Colors matter! Bring in the dress, a swatch, picture, or even send a picture to one of our phones! 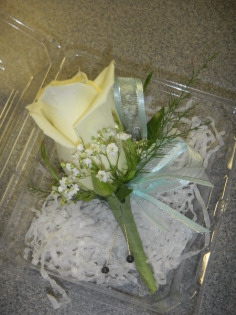 We take the time to show you flowers, ribbons and accents to make your boutonnuiere special! Looking for something more unique? Upon request, and with notice we can do orchids, calla lilies and other specialty flowers.